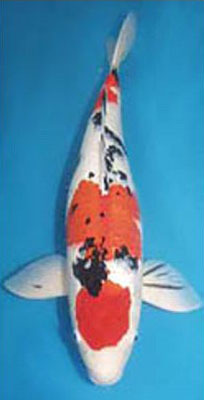 Taisho Sanshoku is a white fish with black and red markings; basically a Kohaku koi with sumi (black) markings. They do not have any black on the head, abdomen, or base of the pectoral fins. It is also called Taisho Sanke or simply Sanke or Sanshoku. Taisho Sanshoku koi have the same standard requirements for white and red as Kohaku do. The white must be snow-like, the red should be intense and evenly distributed and the sumi - lacquer black and ideally this will be distributed in small patches along the body, adding to the overall balance of the pattern. Aka (Hi)Sanke: A sanke that has a lot of red as part of the kohaku pattern, extending from head to tail. Subo Sumi: sumi only surrounded by white. Doitsu: Various patterns as in all of the above except they have the Doitsu scalation. Tancho: Pure white body with a roundish red marking on the head between the eyes, (with no other red on the body). 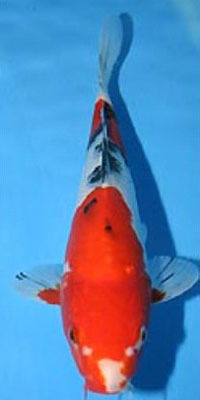 White koi with principally red (Hi), and lesser black (Sumi) markings. Red (Hi) should be blood/dark red, black (Sumi) like darkest night. Some black on fins allowed, a lot undesirable as is any red there. There sould be no black markings on the head. The body should have large red markings complimented with a pleasing distribution of smaller black patches. Subo Sumi: Disjointed pattern, islands of red, with black (sumi) independent (with white surrounding both black and red markings). Nidan (Ni is two in Japanese): Two Step pattern. Two islands of red color that are not interconnected, with black interspersed, overlapping and not. Taisho Sanshoku, which may be produced by spawning like parents or by crossing Kohaku with Shiro Bekko, have fundamentally the same requirements for white and Hi as do the Kohaku. Their skin should be snow white, but not as many Taisho Sanshoku have it as the Kohaku do.Yellowish skin is of course undesirable as are so black spots on the white skin. What is required for the head Hi in the Kohaku is applied to the Sanshoku, too. It must not cover the eyes, jaws and cheeks and should stop before reaching the nose. The Hi markings on both sides of the body should be well balanced. Some white cuts in a large Hi patch or step-type patterns are preferred. Deep heavy Hi which completely covers scale division is attractive. Deep Hi, however, does not always match the white skin and sumi. The harmony of the three is important. Refinely coloured Hi is essential for a fine Taisho Sanshoku. Hi that is uniformly coloured and deep, that the white underneath does not show through are essential conditions. White parts showing through the Hi patches are definite weak points, as are small Sumi spots over Hi and tiny Hi spots rather than patches on the white body. Because the Taisho Sanshoku is three coloured, the percentage of fish with ideal skin and Hi is lower than in pure kohaku spawns. The head is supposed to have no Sumi on it, while the Sumi markings of the body must be well balanced on both sides and must not be small. It is desirable that they do not overlap the Hi, and should form a sort of checkered pattern along the back to the tail joint. Sumi markings which appear on the white are called "Tsubo Sumi," while those overlaping the Hi are called "Kasane Sumi." The former are preferred. Sumi on the bottom half of the body is undesirable, but should be over the entire back as distintive patches, not as small markings or spots which are disliked. 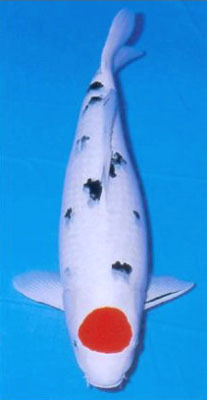 Some Sumi appears in the fry stage, while other Sumi appears as the fish matures, therefore the changes of Sumi must be taken into consideration when choosing the fry.Clear Sumi markings near the borderline of the head and the back are desirable. The fins are required to have Sumi strips, however, an excessive number will degrade the Sanke. Three stripes on the pectoral fins will be sufficent, many Taisho Sanshoku do not have any strips. All other fins should be snow white and free of Hi. As far as the patterns of Hi are concerned, those considered beautiful in Kohaku are likewise preferred in the Sanke. Hi markings should be well balanced on both sides. It is disirable but not necessary that the head Hi does not cover the eyes, cheeks, and jaws. Head Hi which does not spread down past the nose is preferred. Some Sankes have a small Hi marking on the lips, this marking often produces a good balance with the others. The tail region needs a white patch between the last Hi and the tail joint. Basically Sumi is not supposed to appear on the head. A large Sumi marking on the shoulders adds to its attraction. It must be well balanced on both sides, the back half of the body does not need much Sumi. Generally a few, small Sumi markings makes the fish look decent, but large Sumi markings are impressive. Sanke or “Taisho Sanshoku” is a Kohaku with an added black spotted pattern overlaid onto the body. Sanke were first stabilized round 1917(the Taisho Emperor era). All of the criteria for Kohaku also apply to Sanke. In addition, the black spots must add to the overall balance of the pattern. The black or “sumi” spots must all be the same color, must be thick with good kiwa, may have sashi, must be shiny, lacquered black and are preferred on top of the white instead of on top of the red. Sanke sumi spots are usually above the lateral line on the back. Sanke may or may not have black stripes in their fins but too many stripes can make the fins appear heavy. Sanke have a tendency to get too much sumi on the back half of the koi making it appear tail heavy. It is difficult to finish the quality of the hi and the sumi on a Sanke at the same time because the hi peaks early in age and the sumi peaks later. Many Sanke have lost to Kohaku because the sumi on the Sanke was not finished which detracted from the appreciation of the Sanke even if the white and hi of both koi were equal. It seems unfair but on the other hand a Sanke with all colors finished has the advantage of difficulty and rarity over Kohaku. This advantage is not often discussed but definitely an advantage in judging. A Sanke with a circle red Tancho pattern on the head in addition to a red and black pattern on the body is a Maruten Sanke. A Sanke with a red pattern running the full length of the body almost covering the complete top is Aka Sanke. Aka is another term for red.